These restaurant-inspired Strawberry Fields Salmon Wraps have a delightful medley of salmon, strawberries, and salad greens tossed with a homemade feta vinaigrette and wrapped in a spinach tortilla. I’m back with yet another restaurant-inspired recipe! I’ve been giving into my cravings as a source of recipe inspiration lately and it’s making my taste buds really really ridiculously happy. 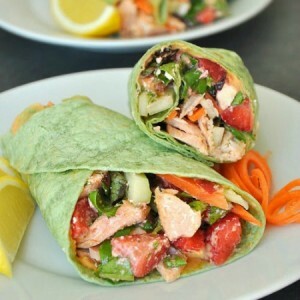 This copycat is courtesy of Yellow Dog Eats‘ heavenly strawberry veggie salmon wrap. It’s a bit unconventional as far as wraps go but ohmygosh is it GOOD! If you’ve ever had super sweet strawberries atop a fresh, crisp salad then you already know what I’m talking about. If you haven’t, you’re in for a treat! Snag some berries once they’re in season in your area [it varies by location!] and give this sweet and savory wrap a try! It’s bursting with antioxidants, omega fatty acids, and tons of flavor! Recipe yields 3 wraps but feel free to simply make a single salmon wrap if needed! I whipped this up to feed a trio, but don’t fret too much over the serving size. The recipe as is will make 3 full wraps or 6 halves. If you’re making this for yourself (as I frequently do!) simply halve the recipe and overstuff the tortilla! If you ever wind up with leftovers, the salmon, vegetables, spring mix, strawberries, feta and dressing can be tossed together to make a fantastic salad. This wrap makes an excellent lunch for picnics, school, or the office! Do a little advance prep by making the full recipe as is, and keeping the components (separately to prevent sogginess) in glass or plastic containers in the refrigerator until you’re ready to assemble. Pair it with pita chips and your favorite hummus or guacamole! Use a little extra hummus to seal the tortilla or fasten with toothpicks if needed. Preheat your oven or toaster oven to 400 degrees F.
Rub salmon with your favorite olive oil and top with garlic powder, paprika, salt, pepper and fresh dill. 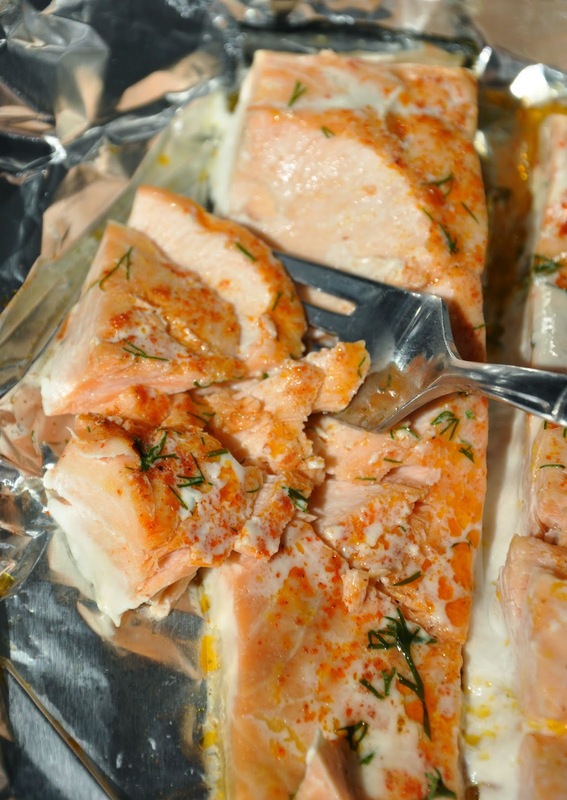 Arrange the salmon on a large sheet of foil and pinch closed into a pouch. Place the pouch on a baking sheet and bake until salmon is opaque, tender, and flakes easily with a fork. Cook time should be approximately 20-25 minutes depending on your oven. While you wait, prep your produce, thinly slice the cucumber and carrots lengthwise. Feel free to use a veggie peeler to create paper-thin ribbons or simply use a knife to julienne them like I did! Remove the hull and tops from your berries and slice into thirds or quarters, lengthwise. Set aside. Next whisk together the dressing by combining all the ingredients listed for the vinaigrette recipe and pulsing together in a blender or food processor until perfectly emulsified and slightly creamy from the feta. When you're ready to eat, toss together the spring mix, strawberries and feta and lightly coat with dressing. Microwave your tortillas for 30 seconds or until they bend and roll easily and spread with a hearty layer of hummus. I use a roasted red pepper blend because I adore the flavor pairing but feel free to use whichever variety of hummus you'd like! 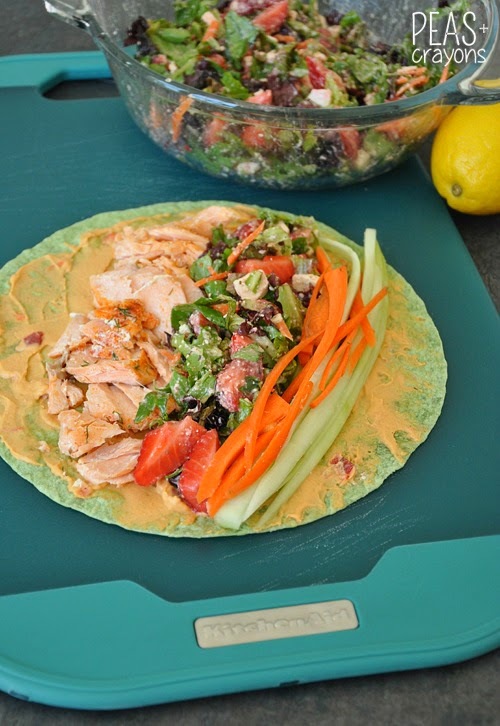 Arrange salmon, strawberry salad mix, carrots, and cucumber on your tortilla and roll. Screw the wraps, I’m ready to eat a bowl of that dressing! Salmon and strawberries?! I’m in! This looks so amaze… pinning now! I love salmon! I am swooning over the Homemade Feta Vinaigrette. P.S. It’s nice to have you back and blogging again. I have no idea why, but I’ve never thought of putting salmon in a wrap before! What a fabulous idea, and I love all the extras you have in here (red pepper hummus is one of my favourites) and the tangy feta dressing sounds like it would pair really well with sweet strawberries. Yum! Ahhh do it! 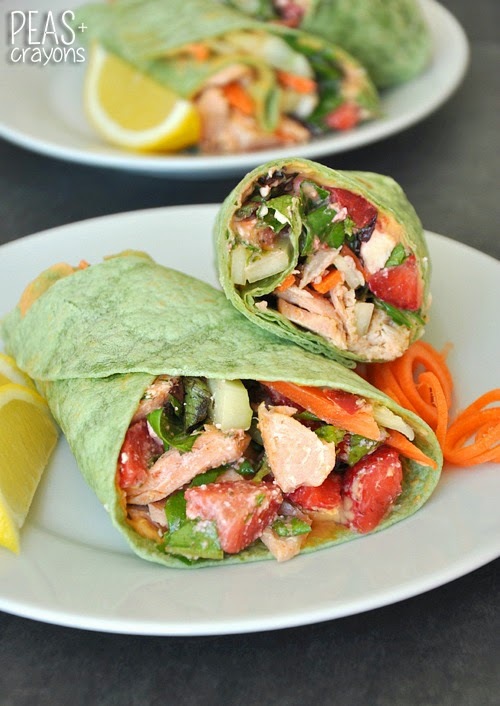 Salmon wraps are amazing! Can’t wait to check out your wrap! I would have never tried the combo until I was coerced into the sammie at YDE and now I feel ashamed for being chicken to try it! Strawberry makes a great wrap stuffer! Especially with salmon and greens! That looks totally amazing. Especially since it has some of my favorite things in it: salmon, feta (umm, feta), strawberries and hummus!